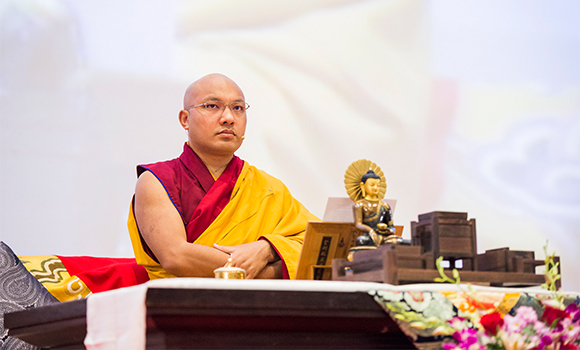 The final session of the 17th Karmapa’s commentary on the Heart Sutra began with a brief explanation of the differences in the view of emptiness among the Middle Way (Madhyamaka), Mind Only (Chittamātra), and the Buddha Nature (Tathāgatagarbha) schools of Buddhism. The prajna paramita sutras, the Karmapa reminded everyone, are the root of philosophy of Mahayana Buddhism. All of its three main schools have their respective views of the four-fold emptiness and how emptiness and phenomena are related. However, the Karmapa cautioned, since all of them are teachings of the Buddha, it is not appropriate to say that one is superior to another. A variety of explanations are available in order to pacify our different afflictions. The Middle Way school considers that the four-fold emptiness shows that all phenomena are essentially not truly existent, and therefore, they resemble an illusion, like the image of the moon reflected on water. Although we see a moon, it is illusory; it appears but is not really there. In this way, emptiness and phenomena are but two sides of the same coin. This is the philosophy of Madhyamaka. The Mind Only school maintains that we misperceive phenomena because of conceptual overlays, the mental constructions that we add on. In looking at the four-fold emptiness, the Mind Only school understands it to mean that things are not the problem; the problem is that we have imposed mistaken concepts onto them. These concepts are illogical and non-existent, but the thing itself continues and there is no problem with it. It is like seeing a rope and mistaking it for a snake: The snake we saw does not exist, but the rope remains a rope—there is no problem with that. The Buddha Nature school considers that the true emptiness is both Buddha’s prajna and the object of that prajna, but we do not understand such an object, so we project many kinds of illusions. These illusions are essentially nonexistent; they are complete delusions, like a person suffering from jaundice who sees a white conch shell as yellow. The main difference between this explanation and the position of the Mind Only school is the following. The Mind Only school maintains that what we perceive directly is not the problem and that the concepts that we impute are where we go wrong. The Buddha Nature school maintains that everything we see is illusory, due to the misperceptions of the truth from the very beginning. All the things we see are the illusions that we project from this basic ignorance. The Karmapa went on to explain that the Buddha Nature school is called the Zhantong school in Tibet. Thought of Mahamudra and the Vajrayana is close to the Zhantong school, due to the view that non-dual prajna is perfect, and enlightened states, realms, and qualities are perfect. Our basic ignorance, however, brings dualistic projections, our mistaken illusions. His Holiness explained that the differences among these schools are to help different living beings dissolve their diverse afflictions. It is hard to say which schools are good or bad, higher or lower. It is important to understand this. We should focus on learning their teachings, which will help to resolve our doubts. Otherwise, people might say that the Middle Way school is the best compared to the Mind Only school, which does not seem to be quite true. There is no ignorance and no extinction of ignorance, up to no ageing and death, and no extinction of ageing and death. These twelve links can be followed either clockwise, in which case they describe the process which traps us in the suffering of cyclic existence, or anti-clockwise, which reverses the process and frees us from samsara. Likewise, there is no suffering, no origin of suffering, no cessation, and no path. The Buddha taught these during the first turning of the Wheel of Dharma, and they form the core of his teachings. The first two truths explain samsara as (1) suffering (the result) and (2) its origin (the cause). The second two truths explain nirvana as (3) cessation (the result) and (4) the path (its cause). There is no prajna, no attainment, and no non-attainment. The excellent qualities of practice are prajna, attainment, and non-attainment mentioned in the sutra, His Holiness said. Bodhisattvas practicing on the path will gradually increase their prajna, attain realization, and eliminate their afflictions. Hence, these three are sequentially called prajna, attainment, and non-attainment—the excellent qualities arising from practice. Whereas the five aggregates, the twelve sense bases, and the eighteen dhatus are the ordinary foundation and relate to samsara, the twelve links of interdependent origination, the Four Noble Truths, and the merits of practice make up the special foundation and relate to nirvana. Those seeking liberation tend to cling tightly to thus special foundation, but they should also recognise that the twelve links and the Four Noble Truths are empty as well. They should cling neither to samsara nor to nirvana. Therefore, Shariputra, since bodhisattvas have nothing to attain, they abide relying on prajna paramita. Since their mind is free of obscuration, they have no fear; completely transcending all error, they reach the ultimate nirvana. They abide relying on prajna paramita. Bodhisattvas training on the path rely on the practice of prajna paramita, which is what they will ultimately attain. “The mind free of obscuration” refers to the mental or cognitive obscurations that affect us and lead to confusion. Bodhisattvas gradually eliminate these cognitive obscurations and liberate their minds. …utterly transcending all error, they reach the ultimate nirvana. By relying on prajna paramita, all the buddhas dwelling in the three times, come to the unsurpassable, authentic, and complete awakening of manifest, perfect buddhahood. These lines explain the path of no more learning, the attainment of buddhahood. Nagarjuna’s disciple Aryadeva once said, “Prajna paramita is the one single thing that leads to door of liberation, and this is what makes prajna paramita supreme.” All the buddhas of the past, present, and future rely on this prajna realizing emptiness to attain unsurpassable buddhahood: There is not a single buddha who did not practice such prajna to become a buddha. “The three times” means that it does not matter who it is or when a person attains buddhahood; they have no choice but to reply on prajna paramita. The Buddha’s realization is “perfect” because it is utterly free of error. This means that not only does the Buddha understand the profound truth of things, but also his knowledge is vast and omnipresent—only the Buddha has such an awakening. Therefore, he has not just a perfect understanding of the profound truth of all phenomena, but vast and omnipresent knowledge. Having come to full awakening, a practitioner will attain the essence of the dharmakaya and realize thoroughly the truth of all phenomena. This perfect realization—the ultimate, penetrating realization of truth—is attained through relying on prajna paramita. The Karmapa then turned to the topic of the five paths—of accumulation, joining, seeing, learning, and no more learning. When this subject comes up, he noted, people often wonder which one of them they have achieved. But it is not that easy. To even enter the path, beginners need to start with listening and contemplating, taking refuge and then the bodhisattva vows. After these, they cultivate bodhichitta through engaging in mind training. Here “mind” refers to bodhichitta, so we are training in developing bodhichitta. If we work hard at it, bodhichitta will naturally arise within us, and at that point, we have entered that path of accumulation. According to Mahayana practice, on this path a practitioner maintains bodhichitta while contemplating emptiness. “Why is the Heart Sutra called the quintessence of all prajna paramita sutras?” the Karmapa asked. For its all-encompassing structure and for the emphasis that the main text places on the single, most important question for all Mahayana practitioners: How do we practice prajna paramita? From the perspective of the structure of practice, Avalokiteshvara first gives the four-fold emptiness and the eight profound meanings to explain how to understand and train in the thought of prajna paramita. (This represents the ground.) He initially applies the four-fold emptiness to the five skandhas, and then relates both the four-fold emptiness and the eight profound meanings to the twelve sense bases, the eighteen elements, the twelve links of dependent arising, the four noble truths, and the merit of practice. (This represents the path.) Lastly, he states that by relying on prajna paramita, all buddhas attain full awakening. (This represents the fruition.) Therefore in a very short space, the sutra condenses the whole of the Mahayana into ground, path, and fruition. Furthermore, the sutra links the five paths of the bodhisattvas. The Heart Sutra is structured into the three divisions of the prologue, the main text, and the completion. In sum, the Heart Sutra is faceted like a radiant jewel, precious and rare, that can be viewed from many angles. Those of higher ability are able to understand the prajna of perfection’s entire ground, path and fruition upon hearing the mantra. Often mantras are classified as belonging to Vajrayana, and sutras are classified as belonging to the Mahayana, but here we find the two together. The Sanskrit word mantra can be divided into man meaning, “to understand” and tra, “to rescue” or “to protect.” Since all buddhas rely on prajna paramita to attain full awakening, the mantra can carry both meanings of understanding the truth and of rescuing beings. The mantra is termed “secret” because it is so profound that ordinary beings are unable to comprehend it. …a mantra of great awareness, an unsurpassed mantra, a mantra equal to what cannot be equaled, a mantra that utterly pacifies all suffering. It should be known as the truth since it does not deceive. “Great awareness” refers to prajna directly perceiving emptiness; vast and omnipresent, it sees the empty nature of all phenomena. No other prajna can match the prajna realizing truth, and so it is “unsurpassable.” “What cannot be equalled” is emptiness and “equal to what cannot be equalled” is “full awakening.” That is the distinguishing feature of this mantra. What is its effect? The mantra “utterly pacifies all suffering,” which indicates that prajna severs the root of suffering. The description of the mantra ends by stating that the prajna and truth such a mantra embodies is not deceptive, so it should be known to be the truth. 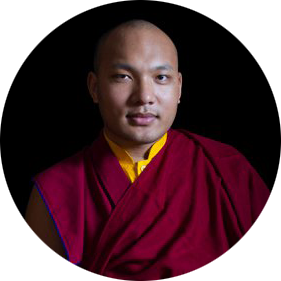 In an aside directed at on the modern world, the Karmapa commented that some people think they are doing great things by just reciting the mantra. The mantra does represent prajna but if we do not have that prajna active in our mind, just repeating the words is nothing special. If we are reciting the mantra and feel inspired, it can help, but just parroting it is useless. Returning to the text, the Karmapa explained that the mantra is made up of six Sanskrit words. When translators were bringing the sutras into Tibetan, they kept some words in transliteration simply preserving their sound. Similarly we saw earlier that if a word had too many meanings, it was also left in its original language. Go forward, go forward, go forward to the other shore, arrive at the other shore, and quickly attain buddhahood. The Karmapa discussed a medley of interpretations for the mantra, noting that since it holds the essence of whole sutra and of profound prajna, its meaning is very vast. Tibetan masters in past, for example, explained that gate, gate refers to going forward to the realization of the Listeners; paragate refers to the realization of the Solitary Realizers and parasamgate points to arriving at the realization of the mahayana. Other masters looked at the mantra through the lens of the three doors or openings to liberation: Gate, gate refers to the first opening of emptiness; paragate points the second opening, being free of characteristics; and parasamgate alludes to the third opening, being free of wishes. Dromtönpa, a lay Kadampa master, wrote that the first gate referred to the path of accumulation and the second gate, to the path of joining. Paragate referred to the path of seeing and parasamgate, to the path of learning. Finally bodhi svaha indicated the path of no more learning or buddhahood. The Chinese masters Yuantse and Fadzang wrote that gate, gate stands for spirit of the Mahayana, because we cannot not go forward alone, but need others to progress. Gate, therefore, is said twice: the first time for ourselves and the second for the others. Paragate indicates the other shore or where we are headed. “And if you are a boatman,” the Karmapa noted in passing, “the benefit is greater if you take others along with you.” Parasamgate is the other shore itself or bodhi. Finally, through the practice of prajna paramita, we can arrive at full awakening, and therefore, svaha. The Japanese master Kukai (Kobo Daishi, or Hong Fa in Chinese) brought the vajrayana (known as Shingon) to Japan. He explained that the first gate referred to the Listeners and the second one, to the Solitary Realizers; paragate indicated Mahayana practice and parasamgate, vajrayana practice. Bodhi svaha referred to the way that all these practices lead to the perfect awakening. Since this is a secret mantra, many masters in the past did not speak of it. Why would Avalokiteshvara what to change that? “The mantra is secret yet it is spoken about, isn’t that contradictory?” the Karmapa asked. Actually, buddhas and bodhisattvas do not have anything they want to keep secret, he explained. The difference between the foundational school and the vajrayana lies in the people and their understanding. If they understand, the mantra is not secret; if they do not understand, the mantra remains secret. Buddhas and bodhisattvas are waiting to teach and benefit living beings; the problem is that they have closed the main door and so the buddhas and bodhisattvas cannot enter. Then the Bhagawan arose from samadhi and proclaimed to the noble Avalokiteshvara, bodhisattva mahasattva, “Excellent! Well done, well done! Son of a noble family, it is exactly so. It is just like that. The profound perfection of prajna should be practiced just as you have taught, and all the tathagatas will rejoice. This quotation can be divided into two parts. The first part, from “Then the Bhagawan rose” to “as you have taught,” shows the Buddha’s support for Avalokiteshvara’s response. The five paths of the bodhisattvas should be practiced just as he had accurately shown. The second part of the quotation, “and all the tathagatas will rejoice,” shows that not just the Buddha and bodhisattvas endorse what Avalokiteshvara said but all the tathagatas do so as well. After the Buddha spoke these words, the venerable Shariputra, the bodhisattva noble Avalokiteshvara, the entire gathering, and the world with its gods and humans, the demi-gods and the gandharvas, all rejoiced and praised the words of the Victorious One. All those who had gathered for the teachings received the answer they had sought—a cause to rejoice and praise what the Buddha had said. With this, the Heart Sutra draws to a close. As these teachings on the Heart Sutra also came to their conclusion, the hall resounded with appreciative applause. After thanking all the people who had helped him prepare for the teaching, the Gyalwang Karmapa then gave a short refuge ceremony and concluded his four-day commentary on the Heart Sutra by giving the oral transmission of the text in Tibetan. The four days have been an awe-inspiring demonstration of His Holiness’ grasp of the complexities of the Heart Sutra, coupled with his ability to get to the heart of the text and express its meaning in terms that everyone could understand. For all those present, listening to this direct exposition has been the most extraordinary privilege.